Western Outdoor Times is a publication of Arizona Boating & Watersports News Magazine. 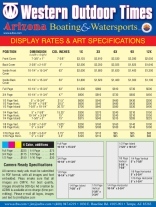 Arizona Boating & Watersports is a monthly print publication. It is distributed primarily in Arizona and Southern California along with a few locations in the United States and several other countries. This publication operates in conjunction with Rock The Boat and Western Outdoor Weekly. Rock The Boat, www.rtboat.com, is project established to restore vintage Chris-Craft boats. Western Outdoor Weekly is a weekly newsletter distributed by e-mail throughout the world.